Wolf-whistling: sexist or harmless fun? July 07, 2017, 10:05 a.m.
Former newspaper editor Eve Pollard made headlines recently by remarking that a woman can be a feminist and secretly enjoy getting wolf-whistled. Pollard bemoaned the fact that getting older has made her “invisible” and that “no man is ever going to wolf-whistle at me or stare moodily at me with a hint of lust again”. 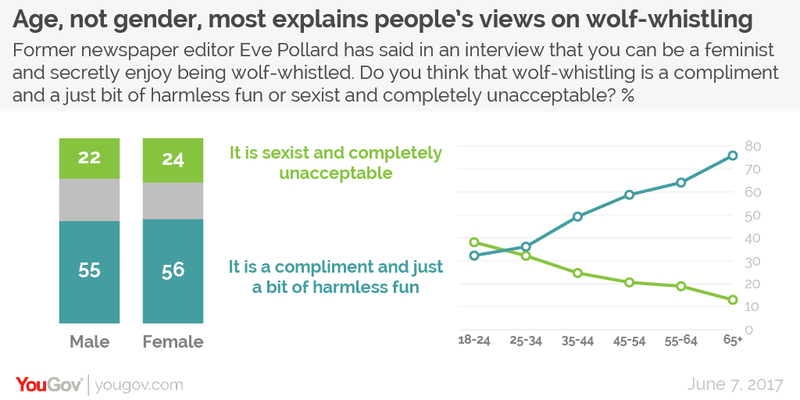 New YouGov research finds that the majority (56%) of Britons consider wolf-whistling to be “a compliment and just a bit of harmless fun.” This is more than twice the proportion who consider it to be “sexist and completely unacceptable” (23%). A further 21% of Brits don’t know either way. The research shows that age is more likely than gender to determine someone&apos;s views on wolf-whistling. While men and women are essentially equally likely to think wolf-whistling is fine (55% and 56% respectively) or unacceptable (22% and 24%), differences emerge between the generations. The youngest Britons surveyed – those aged 18-24 – were the only group more likely to think wolf-whistling is sexist instead of harmess (38% vs 32%). However, each subsequent age group becomes increasingly more likely to hold more positive views, culminating in those aged 65+, where three quarters (76%) say that wolf-whistling is harmless fun compared to just 13% who think it is sexist. Despite the more relaxed attitude of the British public at large towards wolf-whistling, the justice system seems to be turning against it. Last year Nottinghamshire Police made the decision to start recording acts of misogyny – including wolf-whistling – as a hate crime.